ClassX has an advanced software suite dedicated to OEM users and developers. These OEM products have been designed to be integrated with the most simple playout system and with the more advanced newsroom and video automations. The integration with external applications is made by a simple TCP/IP remote protocol. StealthCG is designed for the easiest and closest integration level with any broadcast automation and playout on market. It supports a wide range of broadcast audio/video boards and is capable of producing fully hardware accelerated top-class graphics in SD, HD and 4K resolutions. StealthCG can play any number of MoreCG, CastaliaCG and CoralCG graphics templates at the same time with no limitations. At the same time, StealthCG can produce a/v output through parallel execution of ClassX MediaPlugs (the full set of LiveBoard plugins). 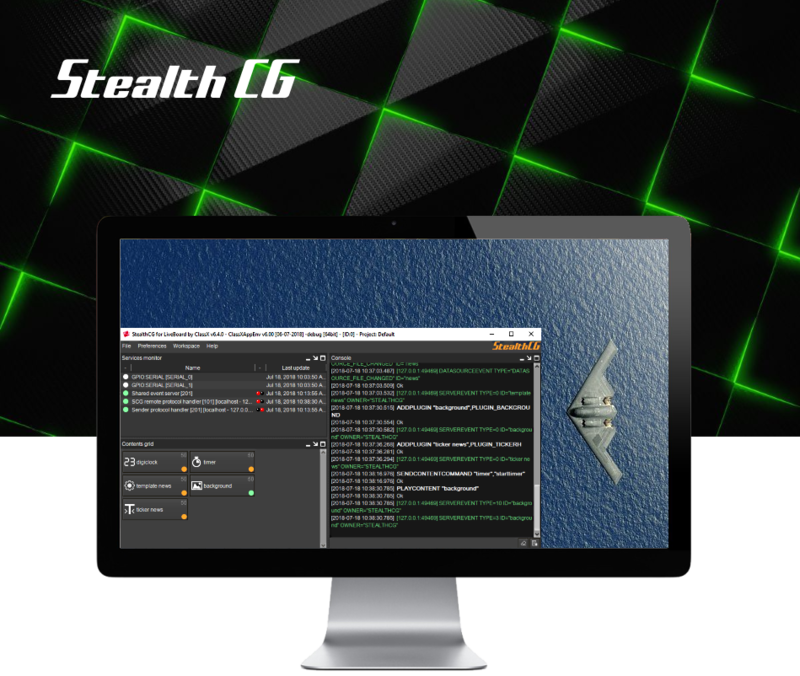 StealthCG is actively developed and improved using the most advanced technologies available today: multi-core CPUs and high-end OpenGL-enabled boards will be thoroughly exploited by StealthCG in order to produce the smoothest state of the art in broadcast graphics. 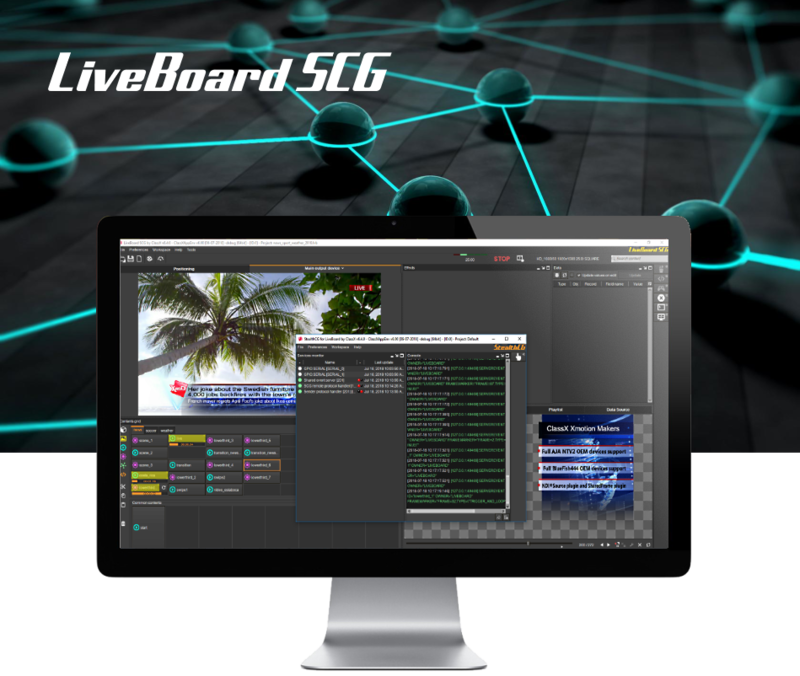 LiveBoardSCG: the flexibility of LiveBoard together with the power of StealthCG blended in the same application. This solution integrates the flexibility of LiveBoard to manage live events with the graphics produced by a video system automation through StealthCG. It shares the same output device and resources; endless multi-layer support: each graphic content of both engines is managed into a single layer and can be mixed, sorted and overlayed on the same output. CGTemplateEditor is the Data editor for ClassX Graphic Templates edited with MoreCG, CastaliaCG and CoralCG. It is designed for being integrated into third party applications e.g. news-editing, rich content editing, video playouts, etc. ; CGTemplateEditor offers a powerful yet easy interface through TCP/IP protocol in order to load and handle many templates at the same time. OEMs can easily drive CGTemplateEditor and also get graphics preview frames of the currently loaded templates. Third party applications can obtain direct access to preview frames through a simple SDK (any programming language is supported). And the nice thing is, it comes at no extra cost with ClassX OEM Applications.